CBNERR York River System-Wide Water Quality Monitoring Program (SWMP). CBNERR staff maintained fixed continuous water quality stations at the Goodwin Island (established October 1997), Taskinas Creek (September 1995), and Sweet Hall Marsh (January 1999) components of the Reserve and at Gloucester Point (March 2003), Clay Bank (January 2002) and White House (Marsh 2003) within the York River estuary system throughout 2008. Multi-parameter water quality monitors (model: YSI 6600 EDS) measure water temperature, specific conductance, dissolved oxygen, pH, turbidity, fluorescence and water depth at 15-minute intervals. In addition, the program collects monthly nutrient (nitrate, nitrite, ammonium, phosphate) and chlorophyll a samples at all primary SWMP stations and monthly diel samples at one SWMP station. Real-time delivery of this data is currently available for selected stations via the NWS Hydrometeorological Automated System (HADS) webpage (http://www.nws.noaa.gov/oh/hads) and selected archived data is available via the web at the NERRS CDMO (http://cdmo.baruch.sc.edu) and Virginia Estuarine and Coastal Observing System (VECOS) (http://vecos.vims.edu). 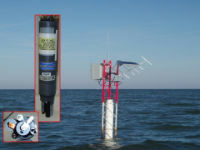 Chesapeake Bay Program Enhanced Shallow Water Quality Monitoring Program. CBNERR staff maintained additional fixed continuous (15 minute interval) water quality stations and conducted high frequency spatial water quality monitoring and mapping (using Dataflow) in a number of southern Chesapeake Bay tributaries. With respect to Dataflow, water quality and GPS location measurements are typically taken at 50-100 m intervals along the vessel track in both shallow (<1.5m) and channel areas. Fixed continuous stations and the Dataflow system utilize multi-parameter water quality monitors (model: YSI 6600 EDS) and measure water temperature, specific conductance, dissolved oxygen, pH, turbidity, chlorophyll fluorescence and water depth. Temporal sampling has typically been linked to SAV growing seasons (high salinity: March-November; low salinity: April-September) but recently has expanded to include late winter/spring to capture migratory fish spawning and nursery use in tidal freshwater and low salinity waters. In addition to York River efforts, continuous fixed water quality stations and Dataflow mapping activities occur within the James (2006-current), Rappahannock (2007-current) and portions of the Potomac (2007-current; fixed stations only). Data are available via the Virginia Estuarine and Coastal Observing System (VECOS) (http://vecos.vims.edu).